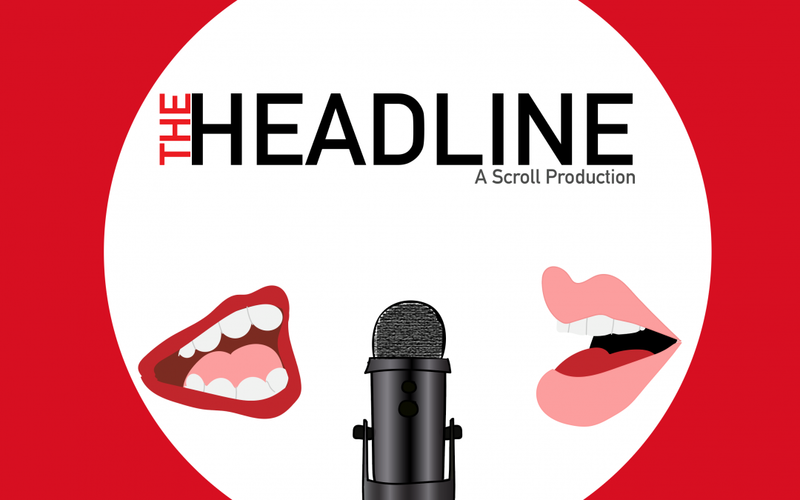 The Headline is a weekly podcast published by Scroll that covers the hot topics, events and students on campus. This week, Rudy Diaz and Travis Hughes discuss the most interesting police log story to date, your end of the semester checklist, and how to destress around finals. Rudy Diaz: [00:00:00] What’s love got to do, got to do with it. What’s love, but a secondhand emotion. What’s love got to do, got to do with it. Who needs a heart when the heart can be broken. Ooh ooh. Yeah. Welcome to The Headline. With me, Rudy Diaz. Travis Hughes: [00:00:27] And me, Travis Hughes. Rudy Diaz: [00:00:27] And boy do we have a show for you guys this week. So with that let’s get this show on the roll peeps. Let’s get started with the police log. This is the interesting one. Travis Hughes: [00:00:42] Yeah, I swear like every week I say it can’t get any better and it seems to get better. I don’t know how it does it but a pretty good police log this week. I definitely would say so. Travis Hughes: [00:01:53] Yeah, that’s a very interesting situation there. Ok, I know plenty of elderly folks that, you know, love kids, they love talking to people, sometimes they feel lonely or they just enjoy being around the youth and the kids. But when you’re approached by a random stranger that tells you how much he loves your kids and how cute they are and how he wants to take one of them home with him. Like I get where the guy’s coming from, but could you just say it any creepier? Rudy Diaz: [00:02:34] Yeah, like I see, like compliment. It was kind of an interesting way to say other kids were cute and that you would take other kids. It’s just not something you would want to hear as a parent, I would assume, I mean I’m not a parent myself but I wouldn’t want, you know, my future kids to hear that. All of a sudden where did little Billy go? Oh no, Prada, where’s Gucci? Those are names of kids I hope to have one day. But yeah, interesting story to say the least. So with that said let’s transition into the things going on with students so alert alert alert, students. We have reached the final two full weeks of the semester and finals week. So there’s still three weeks left, yes, but the last week is designated for finals and stuff like that. So check with your classes to get updated on that information. But with that said, Travis, we are rapidly approaching the end of the semester. Travis Hughes: [00:03:40] Yeah. We’re getting pretty close this semester and with the end of the semester comes a lot of stress for a lot of students a lot of. Well I mean you have finals coming up, you’ve got end of classes. I mean for Rudy and I we’re graduating, so had to make sure that you know we’re passing all our classes and getting prepared for graduation or signed up for everything and have tickets to everything for our families. It’s, you know, it’s a pretty stressful time for everyone whether you’re a freshman or a senior and anywhere in the middle. Rudy Diaz: [00:04:15] Yes, so we’re going to quickly provide some tips in order to combat these stresses and to really, you know, we’re providing a way to limit it to a reasonable extent. But the first one, our first tip and suggestion is to register or plan early for the things to come. It’s really easy to postpone things to the last minute, but please do what you can in order to be prepared for the things coming up either next semester or as the semester wraps up. So with that a great example of this is registration. Now many students may have or have already completed their registering for their classes for this semester. That is fantastic. But for those who haven’t, I urge you guys to please register for the classes that you want so that you can get in. And if there’s a waiting period or what’s that called Travis? Travis Hughes: [00:05:16] Um, the, is it just, it’s the list, it’s something list. Rudy Diaz: [00:05:20] The waitlist. Travis Hughes: [00:05:21] It’s the waitlist. Yeah. Rudy Diaz: [00:05:22] Yeah. If you’re on the waitlist, still get on it, maybe you have a chance you can get an earlier spot so that in case somebody else drops you can still have an opportunity, because once classes are full and set it’s going to be difficult to try and get into those classes. And then the next thing to also look out for as we transition into the next semester are endorsements. Travis Hughes: [00:05:49] Yeah. Once a year you’re required to have your ecclesiastical endorsement done, it’s not done on application. It’s not done. It’s not a one and done thing. It’s typically once a year when your endorsements are required. And so if your endorsements are required — I mean this should be something you’re doing, you know, right now to make sure that you’re ready to go for next semester because of an ecclesiastical endorsement you cannot attend BYU-Idaho. You can’t go to classes you have to be endorsed by your bishop up here on campus or a bishop at home or any sort of ecclesiastical leader. Rudy Diaz: [00:06:28] Yeah. And that’s a very important thing to do because if some of you guys have holds on your account, be sure to check it. That’s one of those. Because they do check for that for each semester that you’re going to start schooling. So for anybody going into school spring semester, and if they have a hold for that get in contact because that will prevent registration and will make a backup that’s not fun to deal. So with that this one last suggestion is also a tip for senior’s graduations coming up. Yes, but there are still deadlines for things to do. And one is coming up pretty quick on April 1, April Fool’s Day, oddly enough. There will be tickets available for the commencement. If I’m correct. Rudy Diaz: [00:07:41] Your endeavors. Travis Hughes: [00:07:41] Yeah, exactly after graduation. Good luck with your careers, and here’s my advice for you. And then convocation is the, it’s the free one you don’t have to get tickets for. But that’s the one where you actually walk and receive your, you don’t actually, I don’t think you receive your diploma at the stand. Rudy Diaz: [00:08:03] But you’re individually recognized. Travis Hughes: [00:08:05] Yeah, you’re individually recognized at the convocation and it’s divvied up between your different colleges that you’re in but commencement does require tickets and those tickets will be available on April 1. There’s limited seating so people wanting to get tickets for their families definitely need to get on that as soon as possible. Rudy Diaz: [00:08:27] Yeah. And so the tickets will become available for the commencement April 1 at yeah, April 1, so time I’m assuming around the morning time. But yeah. Travis Hughes: [00:08:39] Probably midnight or something like that. Travis Hughes: [00:08:53] Something about hotcakes! Rudy Diaz: [00:08:55] And last note on convocation that information so like Travis was saying it’s split up by individual colleges. So for example Travis is in the College of Business and Communication. So their convocation will actually be held in the Hart Auditorium at 8 o’clock, where I’m graduating from the College of Language and Letters. So that will be in the Grand Ballroom at 8 o’clock. Travis Hughes: [00:09:26] So fancy. Rudy Diaz: [00:09:28] I know. Where everybody dances. But yeah. So check with your individual colleges and check your stuff and yeah. So that’s the wrap up on that. Now for those that are still at school though for this semester and having to deal with a lot of finals, actually everybody, hands up because finals week is coming and they can be very stressful. That is a no brainer, that is a duh. But there are so many different activities that people can participate in, in order to take an hour or two off of school and kind of rejuvenate or relax yourself. Transitioning back into work so really quickly we wanted to cover all the miscellaneous activities that could possibly capture your attention. This is all stuff that you can find on the BYU-Idaho Master Calendar. Travis Hughes: [00:10:25] Yeah, all additional information about time and meeting place, it’s all there on the Master Calendar. You can just Google BYU-I Master Calendar. It’s the first thing that pops up. I mean some of the things that I personally, like catch my eye. Fencing is available I believe twice a week on Tuesdays and Saturdays. There’s different workshops like writers workshop, YouTube creators workshop. There’s also open mic, Dungeons and Dragons. Yes, we have a Dungeons Dragons club here on campus. Rudy Diaz: [00:10:58] Yes, D&D. Travis Hughes: [00:10:58] D&D. Let’s see, any others particularly catch my, oh boxing. Yeah feel free to you know put some gloves on and hit some people or punching bags. Rudy Diaz: [00:11:11] Or yeah, practice. Yeah. There’s also such fun stuff such as improv comedy workshop stuff going on, if you feel like being a jokester. There’s also the game on event that happens every other Thursday. There’s also service activities, there’s a general game night. Oh, sorry. Game on is the video game and the game night which is on the 29th is for board games with other people and stuff like that and just so many different activities going on that if you want more information go to the Master Calendar but also check our Scroll website because we’ve covered actually a lot of these different programs in the articles. Travis Hughes: [00:11:54] Yeah, for sure we have covered a lot of these workshops and activities. Rudy Diaz: [00:11:58] Exactly. And if anything, totally get your mind off of work for a moment, school, just get your mind off of everything and just do something other than just sitting at your house. If you tired of doing that, sitting at your house or watching Netflix and stuff like that this is another thing you can destress. Travis Hughes: [00:12:17] Yeah, treat yourself. Rudy Diaz: [00:12:20] Treat yourself and learn a new skill. So with that said this has been another episode of The Headline.